Navatics MITO is an underwater drone capable of shooting 4K 30fps video and 12MP stills. Its Kickstarter campaign was successfully funded last year. Now it is available for pre-order and set to ship in March 2019. Aerial drones have become very common over the last few years and they are being utilised by filmmakers on a daily basis worldwide. When it comes to underwater drones, the market is significantly smaller, but it seems to be growing. Last year we informed you about the Geneinno Titan Underwater Drone. Now there seems to be a (less pricey) competition for the Titan – Navatics MITO is about to start shipping very soon after its Kickstarter campaign last year. 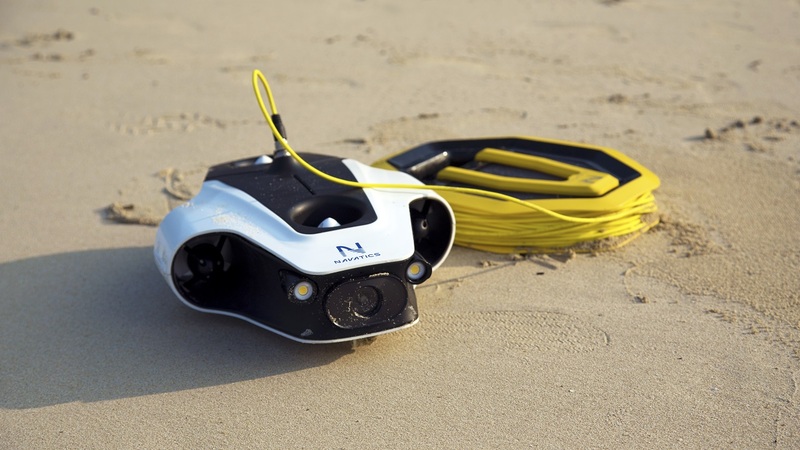 Navatics, the creators of the underwater drone called MITO, made a successful Kickstarter campaign last year already. Their underwater drone got funded and they were able to finish its development. Originally MITO was supposed to ship to backers in September 2018. This schedule got updated however and the shipment has been postponed. 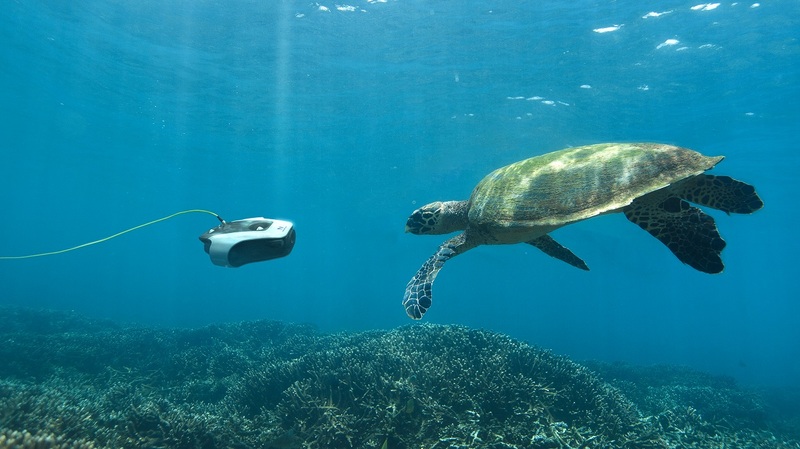 In January 2019 on CES, Navatics officialy announced that their underwater drone MITO is available for pre-order and it is set to ship in March 2019. Let’s take a look at what this device has to offer. 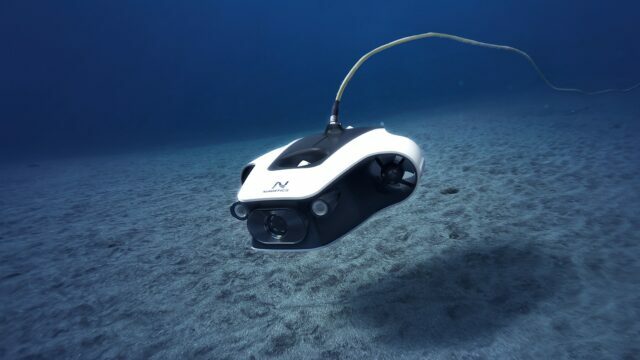 The Navatics MITO underwater drone can capture 4K video at 30 fps and shoot 12MP stills. There is no further information about the image sensor, lens, other resolutions or framerates possible as well as bitrate and available codecs. 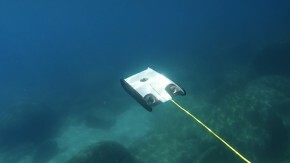 It is attached to a floating tether to transmit controls to the drone deep underwater, where normal wireless controller signals would not reach. The drone can reach depths of up to 130 ft.
Navatics developed their advanced active stabilization algorithm which gives their underwater drone the ability to “hover” and keep its orientation even in complex underwater currents for up to four hours. 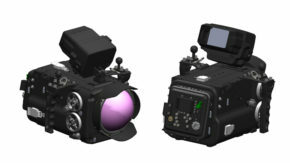 MITO uses four thrusters to maneuver and hold still for stable filming. The drone is small and light enough to fit airline specification for carry-on luggage. MITO is furthermore able to carry a payload of up to 500g – I can imagine mounting a GoPro or additional light for example. 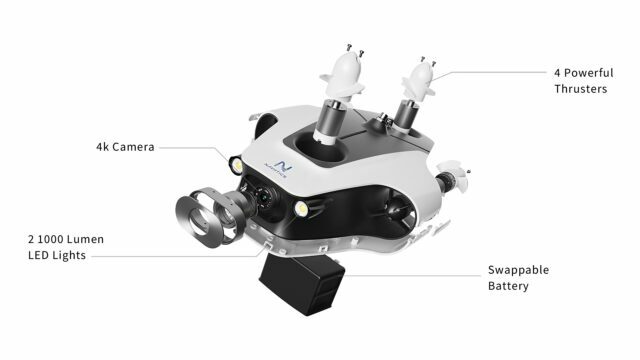 According to Navatics, MITO is the first consumer-grade ROV (remotely operated underwater vehicle) with an adjustable tilt lock, which gives flexibility to its camera angle and movement. It can tilt up and down to 45° angles while maintaining its depth, heading and orientation at speeds of up to two meters per second (around 3.8 knots). 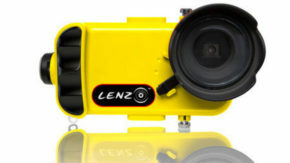 There are two 1000 lumen LED lights on both sides of the lens for extended filming possibilities in darker environments (which can happen very easily underwater). There is no further info about the LED lights (temperature, CRI,…). Navatics MITO is piloted by a remote controller which also has a grip for a smartphone. Through the accompanying mobile app available for both iOS and Android, users have the flexibility to stream video up to 500 meters (1,640 ft.) away at 1080p resolution. In addition, the app has built-in tools for color correction and the ability to share images and video directly to social media. video transmission: 1080 HD at 30 fps live video within 500 m / 1640 ft.
depth: maximum 40 m / 135 ft.
tether length: 50 m / 165 ft.
Navatics MITO is available for pre-order for an early price of $1,499 USD. The package includes the MITO drone, one battery, a remote controller that attaches to a smartphone and a 50-meter (165 ft.) tether. It is planned to begin shipping in March 2019. Just a reminder – the last year’s Kickstarter “early bird” price was starting from $1,199 per unit. 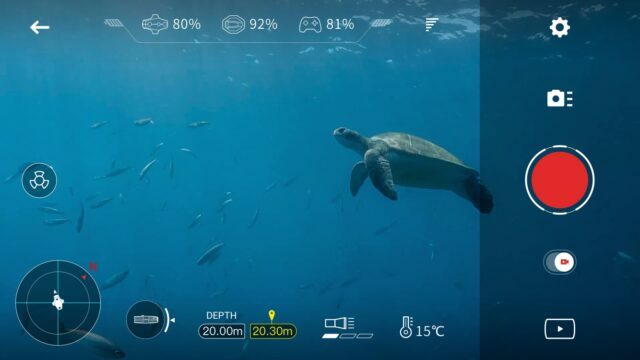 What do you think of the underwater drone MITO? Could you see yourself using such a device? Let us know in the comments underneath the article. Jakub Han is a freelance filmmaker based in Vienna. He is interested in new tech and trends in filmmaking and passionate about action sports and short documentaries. Jakub has over 7 years of experience with camera work and post-production. What’s with the cheesy as hell narrative voice over? That alone caused any interest I might have had in the product to dissipate and transform into pure contempt…. Not just the voice-over, but the the copy. Yeesh!